LAOLA1.TV Downloader - How to download videos from LAOLA1.TV? Download LAOLA1.TV videos to MP4, MOV, WMV for media editor programs, portable media players, iPad, iPhone, Android phones, etc. How to download LAOLA1.TV HD sports videos for offline viewing? Are you looking for a software that helps to download videos from LAOLA1.TV to portable media device? Is it possible to download or edit LAOLA1.TV videos with iMovie, Final Cut Pro or Windows Movie Maker? LAOLA1.TV, the international online sport TV, provides free and pay service. However, no mater which service you choose, there is no download button available. You may have searched for the best solution to download LAOLA1.TV videos. However, there is few programs support downloading from LAOLA1.TV. Bigasoft Video Downloader Pro is one of the top ranked Video downloader that helps to download exclusive highlight-clips and video-LIVE-streams from the world of sports on LAOLA1.TV. Acting as an ideal LAOLA1.TV, Bigasoft Video Downloader Pro makes LAOLA1.TV videos playable without internet connection and editable with iMovie, Final Cut Pro, Windows Movie Maker and other video editors. What's more, the build-in video recorder will help you capture live streamings to high quality MP4 videos. Besides, you can easily export LAOLA1.TV sports videos to any other formats you like, including MOV, MKV, AVI, WMV, 3GP, FLV, WebM, MPEG-1, MPEG-2, etc. How to download LAOLA1.TV videos with Bigasoft? 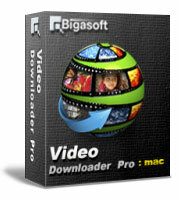 It is easy to use Bigasoft Video Downloader Pro to download or capture videos from LAOLA1.TV. Firstly, download and install the powerful LAOLA1.TV Video Downloader. There are two different versions for Windows and Mac users separately. Go to LAOLA1.TV and copy the URL of the sports video which you want to download, and then paste it to the URL box on the Download panel. As soon as you have copied the URL of the LAOLA1.TV video and mouse over the Past URL box, the URL of will be pasted automatically. Choose Best Available for Download Quality and the Video Downloader will select the highest resolution source to download. Click "Save Folder" button to choose the destination folder for the downloaded LAOLA1.TV video. If you prefer to save the LAOLA1.TV video to a different video format, such as MKV, AVI, WMV or compatible format for your media device, please click the small triangle to the right of the "Automatically Convert to". Then a drop down menu will pop up to let you select your desired format. Click the "Download" button to start and finish downloading LAOLA1.TV sports videos. After it is completed, click the "Save to:" destination folder link to open the "Convert" folder to find the downloaded LAOLA1.TV media. Bigasoft Video Downloader Pro makes it easy to batch download videos from LAOLA1.TV as well as other video sites, including YouTube, Facebook, Vimeo, Dailymotion, Fox Sports, CBSS Sports, Yahoo Sports and more. For live streamings, please open this guide to find "How to record streaming videos".